A few hours after the terrorist attack against Charlie Hebdo in Paris, hundreds of people gathered spontaneously together in Trafalgar Square. With their pens pointing to the sky, the crowd paid tribute to the twelve people who lost their lives in the shooting. 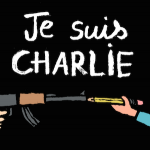 « I AM CHARLIE. » Many people mobilised themselves around this powerful message, last night in London. The invitation was launched on Facebook at the end of the afternoon, in response to the gatherings organised all across France. 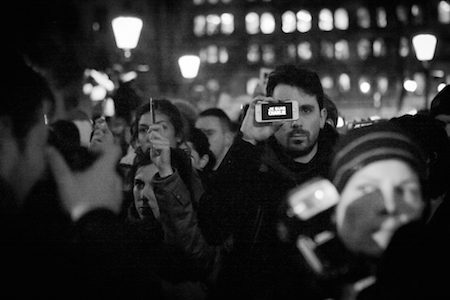 Within a few minutes, the call was heard by hundreds of people on the Internet and at 6pm, French and English people, people who want to defend freedom of expression came together in front of the National Gallery to pay their respects. The minutes passed, the silence was gripping. The events of the morning were indelibly imprinted on the minds of all present. All came to show their solidarity, to share their emotion, to express their indignation. Their pens up in the air, posters held high; “The pen is mightier than the sword!” (or the Kalashnikov for that matter!) a woman shouts towards the crowd, which responds with a huge cheer. Then, someone starts singing La Marseillaise and is soon joined by hundreds of emotional voices. “They wanted to kill Charlie, they made it immortal.” Everywhere, spontaneous gatherings are multiplying. In London, tonight, at Trafalgar Square again, an event is organised; a hundred of cellists and violins will play Barber's Adagio for strings, to pay tribute to those who have left us, and to what they lived for. 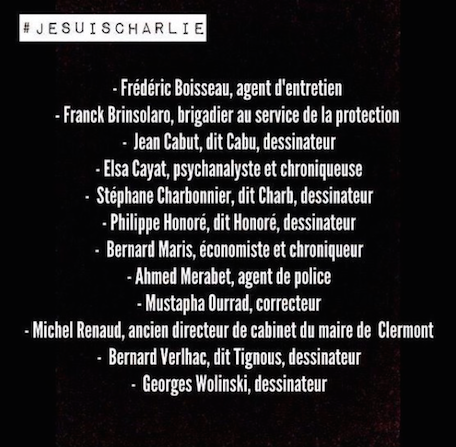 Ou est ce qu'on peut acheter une edition de Charlie Hebdo demain a Londres SVP?? Bonjour à tous, est ce qu'il y aura une marche de solidarité, comme celles prévues en France, demain dimanche 11 janvier à Londres? Merci et bon courage à tous dans ces moments difficiles. ce qui m a fait le plus chaud au coeur c etait de voir une France unie a nouveau et l international nous a montre un elan d amour.